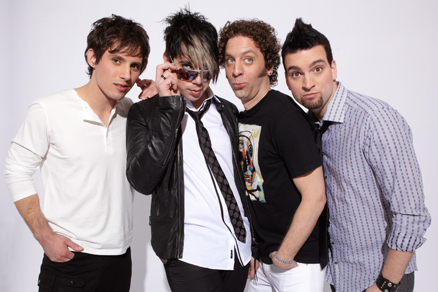 Once upon a time, there were four guys who decided to form a rock band called Marianas Trench. Before too long, they had conquered the music business and were arriving on red carpets in majestic bouncy castles, crowd surfing above thousands of adoring fans, and enjoying the spoils of success and fame across the great land of Canada. And so they lived, happily ever after. Okay, okay. So, that’s not how the story really goes. While it is true that our cover guys have reached a level of success that is the envy of most musicians across the country (and are now planning a takeover of the States in much the same way), the amount of hard work and sacrifice they put into their careers “once upon a time” is unchanged now that they’ve made it. 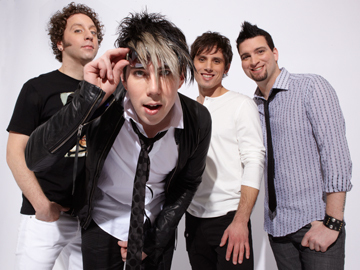 The Vancouver-based band, comprised of Josh Ramsay (lead vocals, rhythm guitar, piano), Matt Webb (lead guitar), Mike Ayley (bass guitar), and Ian Casselman (drums), has released three studio albums to date: Fix Me (2006), Masterpiece Theatre (2009), and Ever After (2011). Their singles, like “Cross My Heart,” “Beside You,” “Haven’t Had Enough” and “Fallout,” can always be heard on the latest countdown or radio playlist. But before they were signed to 604 Records (co-owned by Chad Kroeger of Nickelback), the guys were pouring every ounce of energy into the band, hoping to claim just a corner of the music scene. The guys would work at their part-time jobs during the day, just to pay the bills, and then be in the studio recording demos all night.”We would be working full shifts until 10 or 11 or whatever at night, and then we would go to the studio until 6 in the morning and then sleep for a couple of hours,” says Josh. Then, they’d get up and do it all over again. Looking back on the story it’s easy to say that it was all worth it, knowing that Marianas Trench is a familiar name all over the country. But, back then, success was not a guarantee. That hard work definitely paid off by not only providing them with a record deal, but also giving them a strong work ethic to keep growing their empire. And the long hours continue. As fans we get to see the flashy finished product of an album or music video, which is only so many minutes long, but the band banks a ton of hours to create each product, which gives everything more meaning for them. Music videos are usually a full 24 hours or more of constant shooting, and albums can take hours for just one small sound. “What people don’t think about is literally every little sound that they hear on any song, most likely has been six to seven hours of work,” says Josh. 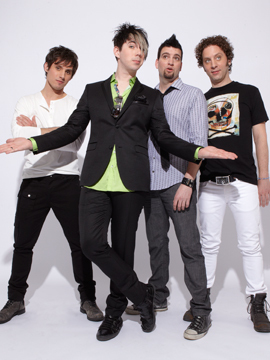 For Marianas Trench, it’s about getting that perfect balance between fun and function. “I think the key to the music business to me is you take what you do seriously, but you can’t take yourself seriously,” adds Josh. “Because we’re playing for smaller audiences [in the U.S.], we have an opportunity to come out and meet people, which we can’t really do as much in Canada anymore,” says Matt. The band can now savour the experience of some one-on-one time with fans as they build a larger international following. And so the writing of the story continues, each chapter telling something new about this talented band. They are forever chasing the next step, making their music better and better—for the music scene, for their fans, for themselves. The thing about fairy tales is that they end, leaving their characters frozen in a pasted-on-smile type of way. They are happily ever after, as if nothing else happens once the ultimate goal has been achieved. But Marianas Trench knows that ever after is not a fairy tale. It’s about continuing to work hard, knowing how far that work ethic has taken you, and believing that it can only get sweeter. Lucky for us, the only fallout of their efforts has been yet another Marianas Trench single we get to keep on repeat—for ever after. Josh: I just got a dog, so I like walking around with the dog. On the cover and these pages, Josh is wearing a Sand suit and shirt, and his own boots. Mike is wearing a Sand shirt and tie, Levi’s jeans and Converse shoes. Matt is wearing Shades of Grey pants and shirt. Ian is wearing J.Lindeberg jeans, Volcom t-shirt and Bunker boots. Check out www.jacflashonline.com and www.triluxe.com.